Hasegawa kit of the legendary North American P-51D Mustang. "Man O' War" flown by Lt.Col. Claiborne H. Kinnard. (Natural metal finish with olive drab striping on upper surfaces. "Helen" flown by Maj. Arthur C. Fiedler. (Natural metal finish with checkertail). 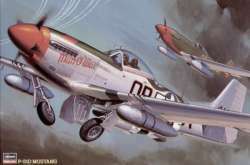 "Butch Baby" of the 355th Fighter Group. (Camouflage with checkered nose band).